What’s cooler than being cool? 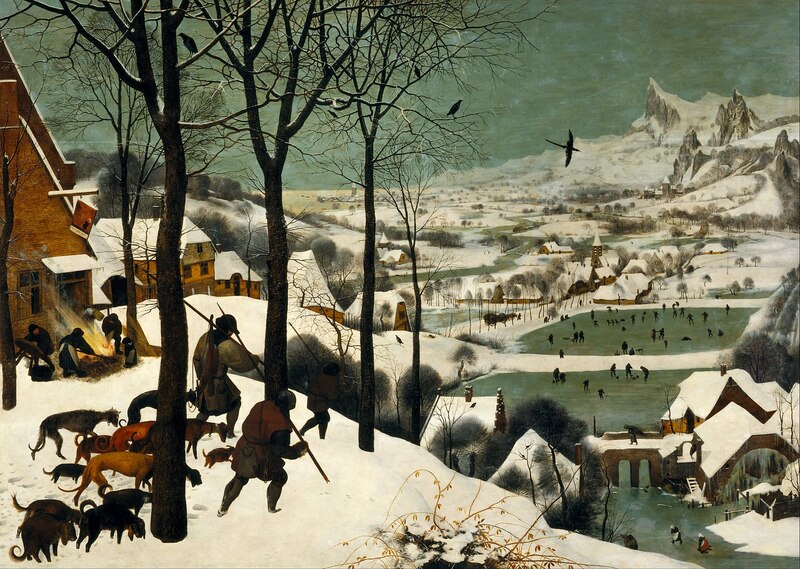 Ice cold, which is exactly the temperature of this super cool painting by Pieter Bruegel the Elder. Painted during a time that may have been considered a “Little Ice Age,” I’m pretty sure this work was just a way for Bruegel to complain about how stinkin’ cold he was. This work was commissioned as a part of a series of the months of the year by the schmancy merchant banker, Nicolaes Jonghelinck for the walls of his schmancy chateau. He was known for having 16 Bruegels by the time he died but the number of paintings in the month series is debated. The obvious answer is that there would be twelve paintings for each month...duh. But there could have been only four paintings representing the seasons, or six paintings if it was like a bi-monthly deal. We pretty much have no idea since it was over 450 years ago. This painting is most notable (in my humble opinion) as the first documented game of curling! I mean sure, the colors, perspective and tone of the painting are important, not to mention the fact that it’s by the most notable artist of the Dutch and Flemish Renaissance, but what’s more exciting than everyone’s favorite winter Olympics game? Nothing. The answer is nothing. Also depicted in the far off distance, past the very sad looking men and dogs (the namesakes of the painting) is ice hockey and face plants. Two other favorite winter pastimes. "Jäger Im Schnee (Winter)". Khm.at. Web. 3 Apr. 2017. "The Hunters In The Snow". https://en.wikipedia.org/wiki/The_Hunters_in_the_Snow. Web. 3 Apr. 2017. "Pieter Bruegel The Elder". https://en.wikipedia.org/wiki/Pieter_Bruegel_the_Elder. Web. 3 Apr. 2017. The Hunters in the Snow (Dutch: Jagers in de Sneeuw), also known as The Return of the Hunters, is a 1565 oil-on-wood painting by Pieter Bruegel the Elder. The Northern Renaissance work is one of a series of works, five of which still survive, that depict different times of the year. The painting is in the collection of the Kunsthistorisches Museum in Vienna, Austria. This scene is set in the depths of winter during December/January. Check out the full Wikipedia article about The Hunters in the Snow.